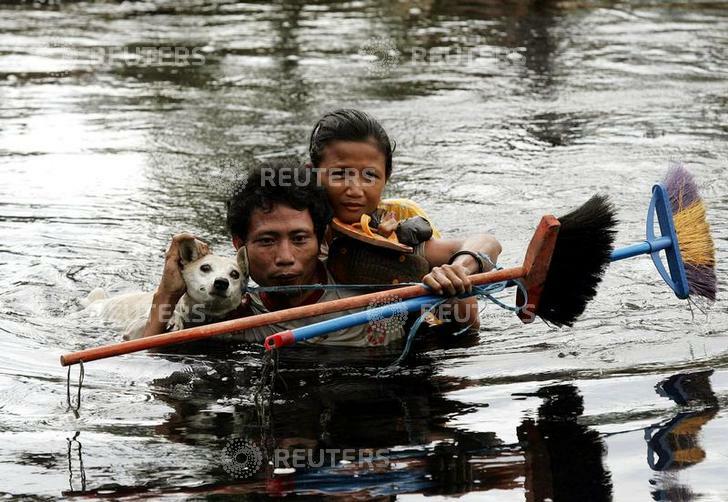 - PHOTO TAKEN 30DEC04 - A man carries his child and dog across a river as they flee an area devastated by the quake-triggered tidal waves on the Indonesian island of Nias, off the coast of northern Sumatra, December 30, 2004. Asia's tsunami death toll soared above 125,000 on Friday as millions struggled to find food and clean water and the world mobilised for what is shaping up to be the biggest relief effort in history. Photo taken December 30.